Intense includes a vast list of 110+ shortcodes (see the complete list near the bottom of this page) and 19 custom post types (FAQ, Portfolio, Project, News, Coupons, Snippets, Templates, and many more). Intense is built on Twitter Bootstrap. It includes parallax content sections with images. Many image hover effect options with Adipoli and Effeckts CSS. Filter blog, and 15 other custom post types with transition effects using MixItUp. Photo sources include Facebook, Flickr, Instagram, SmugMug, deviantART, Zenfolio, and 500px. Easily create shortcodes with the use of shortcode editor dialogs. “Where have you guys been all my life! “To anyone considering purchasing this plugin, it’s definitely the most useful and robust. I was using Ether but not anymore. Ether is definitely limited compared to Intense’s plugin. Animated – Animated allows for animating items on a page. Button – Adds a clickable button to the page. Counter – Displays an incrementing/decrementing number that can be styled. Guests – Show special content for your guests in WordPress. The guests shortcode content will only be shown to non–registered users. Horizontal Ruler – Places a horizontal ruler on the page used for separating content. Icon – Used to add image icons. Lightbox – Add images, videos, html and iframe content within the lightbox shortcode. Members – Show special content for your members in WordPress. The members shortcode content will only be shown to registered users. Permalink – The permalink shortcode allows you to add links to pages or posts on your WordPress site. Progress – Displays a progress bar on the page. RSS – Show RSS feed posts in a list using the RSS shortcode. Siblings – Add a list of sibling pages using the siblings shortcode. Slider – Adds a slider to the page allowing you to rotate between several items. Snippet – You can use the Snippet shortcode to reuse the same snippet across multiple pages, with the luxury of only maintaining the code in one place. Social Icon – Adds a social icon to the page. Social Share – The social share shortcode will allow a user to share a post or page to Facebook, Google+, Pinterest, Twitter, LinkedIn or StumbleUpon. Sub Pages – The subpages shortcode shows a list of pages that are sub pages/children of a given page. Template – Use the template shortcode to add the content of a file template to the post or page. Alert – Alerts are used to notify the user of information. Collapsible – Adds a collapsible accordion to the page. Content Box – Adds a content box to the page. Content Section – Add a content section to your page. Hover Box – Allows you to add a little style to your images with seven different hover transitions. Icon List – Adds a bulletted list of items to a page with the bullets being an icon of your choice. Layout Row – Organize your content into rows and columns for a clean visual look. Masonry – Show content on your pages in a responsive masonry layout using the masonry shortcode. Parallax Scene – Allows you to create a content section where you can add transparent layers stacked on top of each other. Person – Add a person to your page/post. 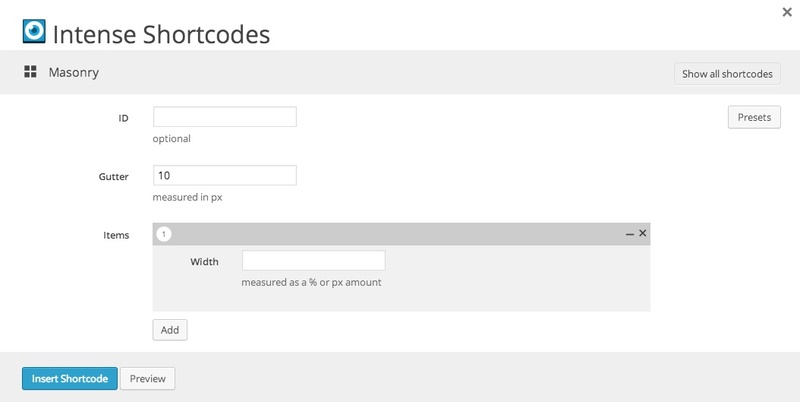 Pricing Table – Add a pricing table to WordPress with the pricing table shortcode. Promotional Box – Add a promotional box to your page/post. Spacer – Adds a spacer between sections on your page. Table – Adds a styled table with column headers and data. Tabs – Adds tabs to the page/post. Testimonies – Allows you to add testimonies to your page. Timeline – Allows you to add a timeline, with multiple events. Audio – The audio shortcode lets you play mp3 and ogg files on your WordPress pages. Chart – Adds a bar, line, radial, polar area, pie, or doughnut chart. Fullscreen Video – Shows a fullscreen video in the background of the page/post. Gallery – Adds an image gallery to the page. Google Docs Viewer – Add a document (ex. PDF, PowerPoint, Word, etc.) to your WordPress websites using Google Docs Viewer. Image – Adds an image with several different effects and options. Image Compare – Compare two images on top of each other. Map – Used to add a Google map to your page. Post Media – Used to add post media (images, video, audio) to your page. QR Code – Adds a QR code chart. Video – Used to add a responsive video from WordPress and many popular sites. Blog – Used to add a list of blog posts to your page. Books – Used to add a list of books posts to your page. Clients – Used to add a list of clients posts to your page. Coupons – Used to add a list of coupons posts to your page. Custom Post Type – Used to add a list of custom post type posts to your page. Events – Used to add a list of events posts to your page. FAQ – Used to add a list of faq posts to your page. Jobs – Used to add a list of jobs posts to your page. Locations – Used to add a list of locations posts to your page. Movies – Used to add a list of movies posts to your page. Music – Used to add a list of music posts to your page. News – Used to add a list of news posts to your page. Pages – Used to add a list of pages to your page. Portfolio – Used to add a list of portfolio posts to your page. Post Fields – Used primarily in conjunction with template custom post type to create templates. Post Meta Data – Easily add post metadata to your WordPress post and pages using the Metadata Shortcode. Project – Used to add a list of project posts to your page. Quotes – Used to add a list of quotes posts to your page. Recent Books – Used to add a list of recent books posts to your page. Recent Clients – Used to add a list of recent clients posts to your page. Recent Coupons – Used to add a list of recent coupons posts to your page. Recent Events – Used to add a list of recent events posts to your page. Recent Jobs – Used to add a list of recent jobs posts to your page. Recent Locations – Used to add a list of recent locations posts to your page. Recent Movies – Used to add a list of recent movies posts to your page. Recent Music – Used to add a list of recent music posts to your page. Recent News – Used to add a list of recent news posts to your page. Recent Pages – Used to add a list of recent pages to your page. Recent Portfolios – Used to add a list of recent portfolio posts to your page. Recent Posts – Used to add a list of recent blog posts to your page. Recent Projects – Used to add a list of recent project posts to your page. Recent Quotes – Used to add a list of recent quotes posts to your page. Recent Recipes – Used to add a list of recent recipes posts to your page. Recent Team – Used to add a list of recent team posts to your page. Recent Testimonials – Used to add a list of recent testimonials posts to your page. Recipes – Used to add a list of recipes posts to your page. Team – Used to add a list of team posts to your page. Testimonials – Used to add a list of testimonials posts to your page. Badge – Places a colored badge on the page. Blockquote – Adds a blockquote to the page. Code – Adds a preformatted code section to the page. Definitions – Add a list of terms and definitions vertically or horizontally. Dropcap – Adds a paragraph dropcap character. Emphasis – Adds a paragraph with text that emphasizes the content. Filler – The filler shortcode helps you quickly mock up content by adding filler text and images. Highlight – Highlights text on the page with a background color. Label – Allows you to add a label to the page. Lead – Adds a lead paragraph good for highlighting a block of text. Popover – Allows you to add a popover to any word/phrase of your choice. Tooltip – Allows you to add a tooltip to any word/phrase of your choice. 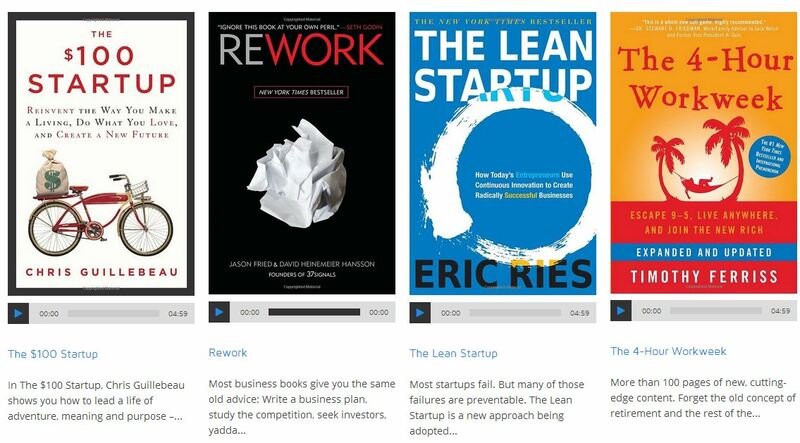 Books – Add books and display them in a number of different layouts. Clients – Add clients and display them in a number of different layouts. Coupons – Add coupons and display them in a number of different layouts. Events – Add events and display them in a number of different layouts. Jobs – Add jobs and display them in a number of different layouts. Locations – Add locations and display them in a number of different layouts. Movies – Add movies and display them in a number of different layouts. Music – Add music and display them in a number of different layouts. News – Add news and display them in a number of different layouts. Quotes – Add quotes and display them in a number of different layouts. Recipes – Add recipes and display them in a number of different layouts. Team – Add a team and display it in a number of different layouts. 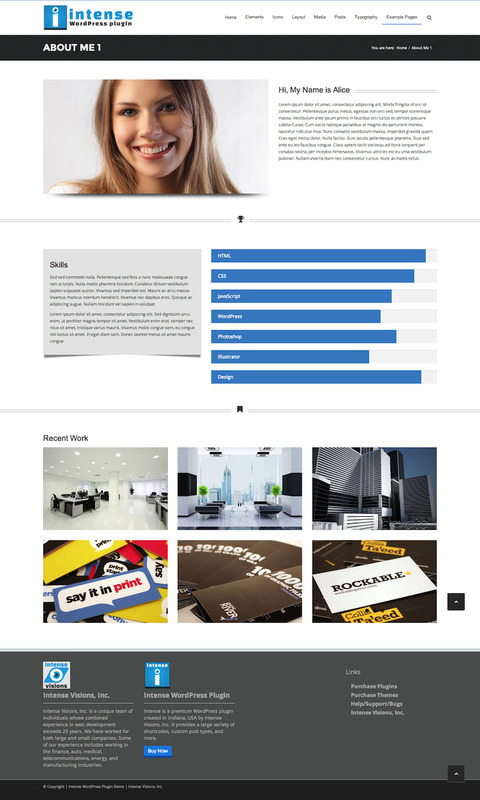 Testimonials – Add testimonials and display them in a number of different layouts. 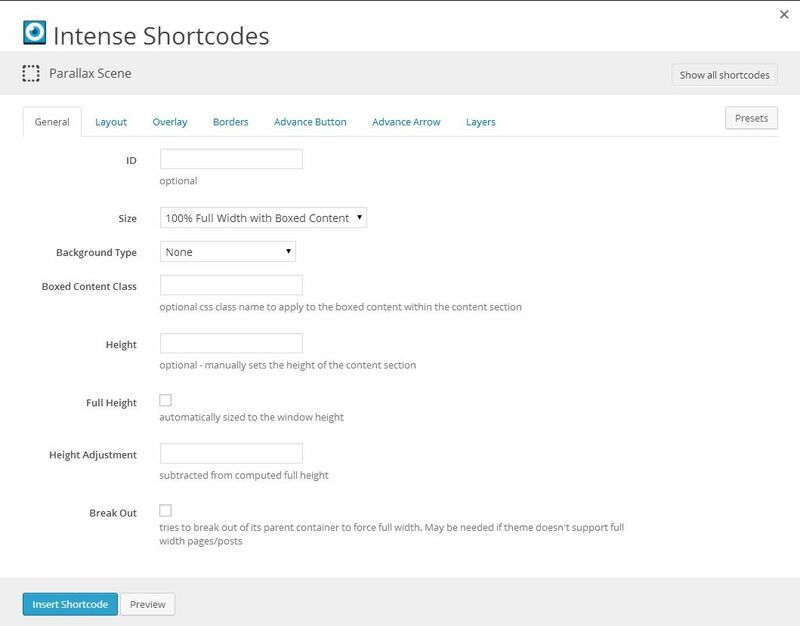 Add shortcodes from the WordPress visual or text editor. Easily add 140 different animation effects. Animate an item on a delay, on mouse hover, on mouse click, when scrolled into view, or after a timed delay . "Order By" date fields to show only posts that are upcoming. * Added "No Posts Message" option to Custom Post Type shortcodes (shows when no results). For a full list of changes, view the changelog found within the documentation.